Simply put, joints hold your bones together - mechanically speaking of course. Most joints are vital intersections or links that allow you to bend, stand, sit, jump and walk. Surrounding these brilliant evolutionary ‘links’ is cartilage. Cartilage acts as a cushiony lubricant allowing the joints to easily move without the bones rubbing directly on one another. When you hear of people experiencing joint pain, it is sometimes a symptom of reduced or compromised cartilage in their joints.Overall joint health may rely heavily on the amount of healthy cartilage you have in between your joints. Excess weight can really put unneeded stress on your joints, especially the knees, hips and ankles. Even dropping a few extra pounds may improve the the health of your joints. According to Harvard Health, when you walk, your knees bear the brunt of 1.5 times your body weight. So to put this in perspective, if you weigh 300 pounds, your knees are feeling the weight of 450 pounds!! And that’s just on a flat surface. If you factor in even the slightest incline, you greatly increase the stress you are putting on your knees. When going up and down stairs, the force felt on each knee is two to three times greater. In the case of our 300 pound person, the knee may be feeling the weight of between 600 to 900 pounds! Quadruple your body weight, and that is the force felt on your joints when you bend down to tie your shoelace. So the constant daily pressure on your joints can really impact the overall quality of your life down the road. Joint pain can affect all age groups and the extent of joint damage may be affected by lifestyle, genetics and a host of other factors. So it is important that we are proactive about the health of our joints. Here are some simple tips you can utilize to give your joints a fighting chance. #1 Maintain a proper weight - Excess weight is associated with an increased risk for osteoarthritis. 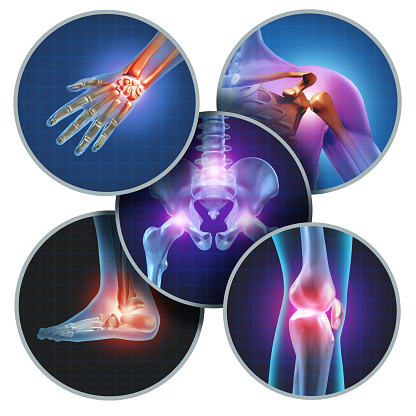 Reportedly, “osteoarthritis is a condition in which the cartilage lining the surfaces of the joints wears thin due to the bones rubbing on each other for a long period. “ This causes joint pain and stiffness. There is credible evidence that “overweight and obese individuals with knee osteoarthritis can reduce pain by 50% and significantly improve function and mobility with a 10% or more weight loss over an 18-month period. “ So responsibly managing your weight is good for joint health. #2 Cut down on inflammatory drinks - Get ready for a deluge of nagging habits that can really leave your joints aching. While you may be able to squeeze in a glass of red wine every once in a while, it is recommended that the overconsumption of alcoholic beverages should be limited as it exacerbates inflammation in the joints. Put down the sodas as well. The aspartame, which is the same as artificial sweetener, contained in some soft drinks is thought to increase levels of acidity in the body which may cause joint pain. There are several other ingredients in soft drinks that may work to worsen osteoarthritis by compromising joint health. You may want to try tea instead. Green, black and white teas are all rich in polyphenols. Polyphenols are compounds from plants that have strong anti-inflammatory effects. #4 Erase fried and processed foods from your shopping list - One of the biggest stressors on our bodies is what we feed ourselves. Sure, environmental factors can take a toll. Even stress can be an unneeded burden to the overall nervous system. But food and nutrition may be one of the most important factors in how our body ages and how we fight off early onset disease. If you feel as if you are experiencing some hints of joint pain, you may want to reduce your intake of red meat, fried foods and sugar. The excess sodium and salt contained in fried or fast foods can really inflame already irritated joints. It is best to stick to whole foods including fruits and vegetables if you want to clear your system of inflammatory byproducts. #5 Exercise, Exercise, Exercise! - It may seem like a no-brainer, but exercise can greatly extend both life and limb, literally. Simply ignoring the aches and pains won’t make them go away. In fact, succumbing to a sedentary lifestyle can work against you. The benefits of maintaining a decent range of motion and flexibility through low-impact exercise can help you in the long run. #6 Magnesium intake - Clinical studies suggest that magnesium plays a critical role in bone and joint health. Magnesium helps the body, tissue and bones absorb calcium. Without magnesium the body can’t stimulate calcitonin, a hormone that helps draw calcium from the blood and tissues and moves it back into the bones. There are lists upon lists of joint boosting supplements, but why don’t we take a closer look at some lesser known joint-fortifying foods that you can incorporate into your daily life to cut down on inflammation and boost joint health. Papayas - Who knew, right? They aren’t just exotic side fruits. Papayas contain a digestive enzyme called papain that is known to for its anti-inflammatory properties. Papain is a proteolytic enzyme extracted from the raw fruit of the papaya plant. Proteolytic enzymes help break amino acids down into smaller strings of protein and is a popular folk remedy to reduce pain and inflammation. Ginger Root - Ginger is an impressive and versatile root. You can blend into it smoothies, chop it into a stir fry or dust it into salad dressings to reap the benefits of this remarkable root. Ginger has been used in Asian medicine for centuries and is known for its anti-inflammatory properties. Ginger also suppresses inflammatory molecules, such as leukotrienes, and switches off certain inflammatory genes, potentially making it more effective than conventional pain relievers..
Pineapples - What makes pineapple the talk of the town these days is that it is loaded with bromelain. This magical enzyme decreases the pain and swelling associated with rheumatoid arthritis and osteoarthritis. Because bromelain is thought to have pain-relieving properties that are comparable to NSAIDs, it is a great dietary choice for those that are experiencing joint pain and want to aim for increased mobility. An important thing to remember. It is your body, so be good to it. It seems that our habits and learned behaviors have gotten in the way of us making the best choices when it comes to diet, lifestyle and mindfulness. While that is understandable, it is never too late to adopt new ways of shopping for food, hobbies to fill your free time and habits to replace the old ones. If you want to protect your joints and live an active life, then minor shifts in lifestyle shouldn’t be a large price to pay.